Party And Event Rentals offers a s election of bouncers, combos, water slides, slides, interactive games, concession machines, and more. We continually add new and exciting inflatable units to our rentals. All of our inflatable units are in great condition and cleaned after every use. All of our inflatable units meet the latest standards for safety in design and operation. We provides an easy method for online rental, all it takes is a few steps to rent from us. 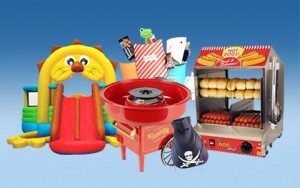 Party & Event Rentals thrives on its excellent customer service so customers can enjoy their party without any worries. Party And Event Rentals provides inflatable rentals service to all occasions, such as house party, school party, business events, birthday party, block party, city events, day care centers, anniversaries, weddings, etc. At Party And Event Rentals we are devoted to providing our customers with the best quality service along with the safest, cleanest, and newest products that will make any event an unforgettable one. Also if your thinking of starting your own business, we also offer consulting and support to those interested in operating their own inflatable entertainment businesses featuring top quality inflatable products suitable for indoor and outdoor use. So whether you are interested in supplying your business with superior grade play equipment or starting your own inflatable entertainment center, one call to us will have you well on your way To a successful career in the lucrative inflatable rentals business.